A Steve Jobs action figure. Not compatible with any other action figure. 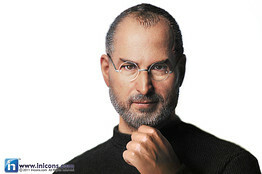 Image of the Steve Jobs figurine from the In Icons website. Want to carry Steve Jobs around in your pocket? There’s an action figure for that. A 12-inch figurine of the co-founder of Apple is being promoted by the company In Icons for $99.99–beard, spectacles, mock black turtleneck, jeans and New Balance sneakers included. (The price doesn’t include shipping.) The unauthorized action figure, which some have called creepy due to its lifelike details, goes on sale next month. Previous Post: It’s a FAAAAAAAAKKE!